Ravens Lane Bridge No 142 is a minor waterways place minor waterways place place on the waterways major waterways place village town city on the Grand Union Canal (Grand Junction Canal - Main Line - Gayton to Brentford) between Bulbourne Junction (Junction of Grand Union Wendover Arm with Main Line, Braunston 55¼ miles / Wendover 6¾ miles) (6 miles and 3¼ furlongs and 9 locks to the northwest) and Grove Ornamental Bridge No 164 (8 miles and 7¼ furlongs and 21 locks to the southeast). The nearest place in the direction of Bulbourne Junction is Berkhamsted Middle Lock No 54; ¼ furlongs away. 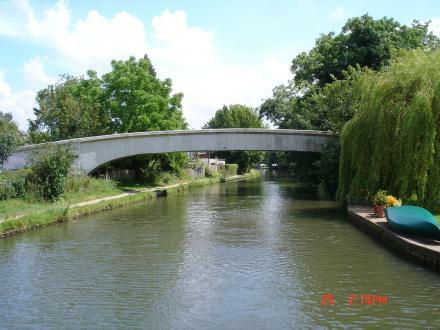 The nearest place in the direction of Grove Ornamental Bridge No 164 is The Boat PH (Berkhamsted); a few yards away. Gravel Path, Berkhamsted, HP4 2EF — 22 yards to the east. George Street, Berkhamsted, HP4 2EG — 213 yards to the southeast. 83 High Street, Berkhamsted, HP4 2DF — 268 yards to the southwest. 277 High Street, Berkhamsted, HP4 1 — 1000 yards to the west. London — 1412 yards to the northwest. 262 High Street, Berkhamsted, HP4 1AQ — 803 yards to the west. Graemesdyke Road, Berkhamsted, HP4 3LZ — 1527 yards to the west. 15 Gravel Path, Berkhamsted, HP4 2EF — 60 yards to the northeast. Berkhamsted — 219 yards to the west. 168 High Street, Berkhamsted, HP4 3AP — 490 yards to the west. Berkhamsted — 393 yards to the west. 345 High Street, Berkhamsted, HP4 1AL — 967 yards to the west. Berkhamsted — 1187 yards to the west. 136 High St, Berkhamsted, HP4 3AT — 427 yards to the west. Berkhamsted, HP4 2 — 865 yards to the northwest. All Saints Church, Berkhamsted, HP43HY — 1285 yards to the west. Berkhamsted — 949 yards to the west. Berkhamsted — 1154 yards to the west. 137 - 139 High Street, Berkhamsted, HP4 3HH — 554 yards to the west. 59 Gossoms End, Berkhamsted, HP4 1DF — 1556 yards to the west. 125a High Street, Berkhamsted, HP4 2DJ — 377 yards to the west. 145 High Street, Amersham, HP4 3HH — 477 yards to the west. 300 High Street, Berkhamsted, HP4 1ZZ — 967 yards to the west. Berkhamsted — 680 yards to the northwest. Kitcheners Field, Berkhamsted, HP4 1HE — 926 yards to the north. 3A Bridgewater Rd, Berkhamsted, HP4 2 — 554 yards to the northwest. 21-23 Lower Kings Road, Berkhamsted, HP4 3 — 593 yards to the west. Berkhamsted — 557 yards to the west. Berkhamsted, HP4 1LJ — 491 yards to the north. 163-165 High Street, Berkhamsted, HP4 3HB — 524 yards to the west. 145 High Street, Berkhamstead, Berkhamsted, HP43 — 480 yards to the west. 222 High Street, Berkhamsted, HP4 1AG — 693 yards to the west. 61 High Street, Berkhamsted, HP4 2DE — 255 yards to the south. 1 Fieldway road, Berkhamsted, HP4 2NX — 1306 yards to the southeast. St Johns Well Lane, Berkhamsted, HP4 1HS — 743 yards to the west. George Street, Berkhamsted, HP4 2EG — 142 yards to the southeast. 172-176 High St, Berkhamsted, HP4 3AP — 483 yards to the west. Berkhamsted — 93 yards to the southwest. 38 London Road, Berkhamsted, HP4 2NE — 1033 yards to the southeast. 97 High Street, Berkhamsted, HP4 2DG — 287 yards to the southwest. Berkhamsted — 264 yards to the southwest. 147 High Street, Berkhamsted, HP4 3HL — 482 yards to the west. The Stables, Ashlyns Hall, Chesham Road, Berkhamsted, HP4 2ST — 1370 yards to the southwest. 8 Townsend Gate, Berkhamsted, HP4 2FZ — 784 yards to the southeast. 85-87 High Street, Berkhamsted, HP4 2DF — 285 yards to the southwest. Manor Street, Berkhamsted, HP4 2DL — 152 yards to the west. Berkhamsted — 247 yards to the southwest. High St, Berkhamsted, HP4 2FG — 278 yards to the southwest. 6 Chesham Road, Berkhamsted, HP4 3YP — 261 yards to the west. Berkhamsted — 879 yards to the south.